A powerful typhoon sliced through Japan Sunday, injuring dozens, halting transport, and bringing fierce winds and torrential rain to areas already battered by a string of recent extreme weather episodes. Typhoon Trami sparked travel disruption in the world's third-biggest economy, with bullet train services suspended, more than 1,000 flights cancelled and Tokyo's evening train services scrapped. At least 84 people suffered minor injuries, many hurt by windows shattered in the driving wind, and one woman in her 60s was reported missing amid fears she was swept into a gutter. After pummelling Japan's outlying islands including Okinawa, the storm made landfall south of the city of Osaka in the western part of the country around 8:00 pm local time (1100 GMT). Yuji Ueno, an official in the town of Shirahama near where Trami made landfall, told AFP the winds were "enormous" and made it impossible to venture outside. "We saw incredible winds and rain. I stepped outside the city hall in the afternoon, and the rain was swirling in very strong wind. Enormous wind." "It was difficult to stay standing. It was very scary," said Ueno. Trami, which at its height packed maximum gusts of 216 kilometres (134 miles) per hour, was expected to churn over most of the archipelago, weakening slightly but causing extreme weather into Monday, forecasters said. Weather officials have warned of potential flooding and landslides and non-compulsory evacuation advisories have been issued to around four million residents, according to public broadcaster NHK. More than 750,000 households, mainly in western Japan have lost power, according to local utilities and mobile phone services suffered disruption. 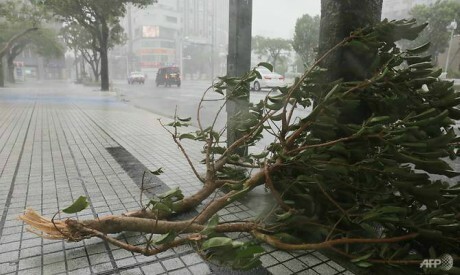 The typhoon did not hit the capital head-on but Tokyo still saw fearsome winds and lashing rain later Sunday and the streets of one of the world's biggest cities were deserted. At the world-famous crossing in Shibuya, where thousands normally jostle every few minutes as the lights change, just a few hardy souls braved the horizontal rain and powerful gusts. Shops and business closed early as the capital hunkered down for the storm. Osaka lay close to the path of the storm and its Kansai Airport, which is situated on reclaimed land offshore and suffered extensive damage in a storm earlier in September, closed early as a precaution. Speaking to AFP from a hotel near the airport, British businessman Richard Swart said: "It's actually quite warm outside, very windy and with very heavy rain." "The airport is closed. There are very few people around and all the shops are shut. It's really deserted," added Swart, 56, from Durham in northern England. East Japan Railway stopped all train services in and around Tokyo at 8:00 pm, shortly before the typhoon hit the Japanese capital. Also in September a magnitude-6.6 earthquake rocked the northern island of Hokkaido, sparking landslides and leaving more than 40 people dead.